Hello Sara, I always, Stephen. You know I lost my father recently and I often think of him and my mother, who is no more now for almost four years. It is a time a bit special and often I think of my parents. This thought gives me strength. I often ask for help and advice to my Guardian Angel, in particular, when the evenings I am in bed, before falling asleep. Do you remember, not long time ago, I wrote you about a heart that I saw, but I had not the opportunity to photograph it. 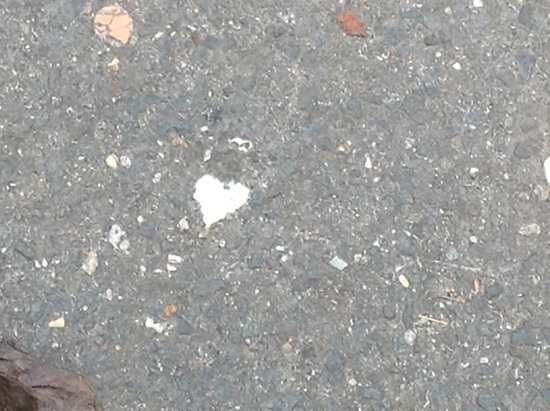 This morning, like every other day, while I was catching the train to go to work, I saw a heart on the floor and at that moment I thought of my father. Then while I was near the place of work, I saw another. You're right, my Guardian Angel is close to me. They are great gifts from Heaven, just have an open heart! Hello Sara and as usual, a huge hug.